Artist Don Geyra has lived a life behind the curtain while on Broadway, in movies and on television. Now in Bloomington, he's ready for the next scene to unfold. This Ramones cutout is just one piece of memorbilia left over from Don Geyra's days in the Bowery. "These are my friends," Geyra says. "Do not make eye contact." "Do not get on the elevator with him." "Stay out of his way." The scenic crew obliges, used to the rules set by method actors. After all, scenic art is serious work with high pressure and short notice. The task at hand is the movie's most important prop: a brand new wicker table that needs to look aged and worn. Geyra attacks it with only 45 minutes until cameras roll. He sands the raised areas of the wood, brushes on a tinted glaze and wipes the table down, allowing the color to sink into the sanded grain. It looks as if Pacino has been playing cards on it for years. Geyra dips a coffee cup in a warm tinted glaze and presses it gently on the table -- coffee dribbles, perhaps from the previous morning. Suddenly, he feels a presence next to him. An arm wraps around his shoulders, and a strong hand gives him a squeeze. It's Pacino. Geyra shrinks, remembering the rules. He's not supposed to look at him, not supposed to talk to him, and here Pacino is hugging him. "You know, I just wanna tell you, man, you really came through for me," Pacino says. "We needed it fast, and we needed it perfect, and you did it. I just want to thank you. And I want you to know how much it means to us to have this to work with." Experiences like this are special in a scenic artist's life. They're typically behind the curtain, unseen by the public but critical to the production. Scenic artists are the magicians of set design, assigned tasks meant to blend in seamlessly, expected to transform everyday objects into breathtaking scenery and crucial props. Without their expertise, movies, television and theater would be bland and featureless, yet scenic artists go largely unnoticed. They're the manpower and paintbrush behind the vision, creating the space for the action to live. Don Geyra, now 60, a fine arts graduate from Indiana University in 1977, has been doing scenic art for 32 years. He's worked on Broadway shows from "Cats" to "Young Frankenstein." He did movies like "Biloxi Blues" and "The Devil Wears Prada" and his television repertoire includes "The Cosby Show"and "Ugly Betty". Today Geyra's hair is a little more gray. He's returned to Bloomington for a rest from New York and the demanding schedule of an active scenic artist. He's grateful for a break, but Geyra insists that scenic art isn't something he can just quit. Since he moved to Bloomington in 2012, Geyra has teamed up with the Indiana University Opera, painting backdrops for productions like The Tale of Lady Thi Kinh. It was, he says, one of the three best jobs he's completed in his lifetime. "It was just glorious," Geyra says. "Visually, that was unbelievable." The Tale of Lady Thi Kinh featured backdrops, 40 feet high and 70 feet wide, adorned with blossoming cherry trees, a vibrantly purple moonlit night and large silky clouds rolling across the stage, all designed by Mark Smith and painted by Geyra. Smith has been working for the IU Opera and Ballet Theater for 17 years and has been director of scenic painting for the last four. He and Geyra combined their painting talents and techniques for The Tale of Lady Thi Kinh. "We work with a variety of designers, and each show features a unique design," Smith says. "Don has been a valuable local resource for us, and I'm always eager to observe how others approach a project. It's been great for me to watch him work." While in Bloomington, Geyra is doing the work he's asked to do at the IU Opera and making the most of his retirement. He finally has the opportunity to just paint, something he had little time to do as a scenic artist in New York. He can go out and enjoy the town, then return home to let his imagination go. Another perk of being in Bloomington is the local art scene. Geyra often visits The Venue on Grant St., where his paintings are displayed along with the work of other area artists. Many of their works adorn his home. "I'm not buying them just to support the whole starving artist thing," Geyra says. "It's actually, truly great artwork. I buy it because I like it." Gabriel Colman, owner of The Venue, agrees with Geyra. "I know that Don was thoroughly impressed with the creativity that exists in this community," he says. "He was drawn to retire here because it had the cultural diversity of a big city but in a small-scale setting that would allow him to relax." And relax he does. He and his wife Theresa, a nurse in Bloomington, enjoy a quiet suburban lifestyle but never hesitate to have a night on the town. You can see Geyra on The Square for First Fridays, stopping in at The Venue for exhibits, cruising around Monroe County on his beloved 1981 Harley Davidson (hand painted by Geyra to look like marble) or just grabbing a drink at the bars. Always a talker, he'll grace you with stories of the glory days, both at IU and, of course, in New York City. Geyra lived in the New York Bowery from 1977 to 1981 during the prime years of the punk scene. As a manager at the legendary CBGB nightclub, he was part of one of the biggest eras of music history and amassed an impressive record collection that now lines his Bloomington basement studio. At CBGB he experienced bands like The Talking Heads, Stray Cats, The Dead Boys and the iconic Ramones. In fact, Geyra lived just above the Ramones and became close friends with the band. 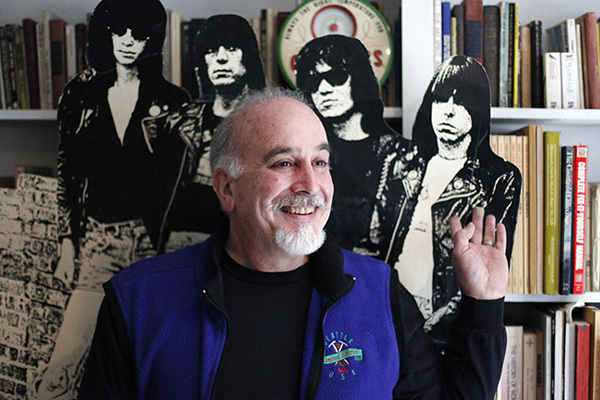 Memorabilia from the era is now scattered throughout his Bloomington house, including the original Ramones T-shirt silk screens, created and slashed by Arturo Vega, and old promotional posters of the band. But dearest to Geyra are the memories of his friends. "I had the first answering machine anyone had ever seen," Geyra says. "Joey goes, 'Man, that is cool. Can I put an announcement on?' So Joey Ramone was on my answering machine. He goes, 'Hey, uh, this is Joey. This is Don's phone. Leave a message and he'll call ya back -- if you're lucky!'" Although Geyra never turned down a good time, when he was on the job he worked with dedication and focus. Scenic art is demanding, with long days, hard physical labor and high pressure to get things done efficiently. Dozens of artists would line up on high scaffolding, working through the night to meet deadlines. They often had to fight the weather if working outdoors, or even risk their safety with jobs in dangerous neighborhoods. Geyra was once required to work in what was called Alphabet City, an era of the city which was pre-gentrification, with high crime rates and drugs running rampant. He was working in a children's park, abandoned and overgrown with weeds. "The set dresser comes in with a weed-wacker, suddenly all this stuff comes flying out of the shrubs -- needles, vials. Literally there are hypodermic needles all over the place." On the same job, he was told to go to 127th and Lexington Ave in Harlem and paint out all the graffiti -- graffiti belonging to people who died, represented gangs and claimed territory. "I said 'Why don't you just kill me now? You can't just go paint that out, they'll kill me!' I got out of that one, you know. Live to paint another day." The difficulties of location, time and weather aren't the only adversities scenic artists face. Author Peter Beudert, a professor for the School of Theatre, Film and Television at the University of Arizona, says one of the biggest differences between scenic and studio art lies in scale. Scenic art is created on massive canvases large enough to fill the stage. Close up, the artwork may look a little odd, but step 15 feet back and the masterpiece comes together. "The effects of the perspective really are striking, and the depth expressed is much more prominent," says Beudert. "You have to make an intellectual shift to make sure that your technique is correct." Scenic artists also have to learn to think out of the box when it comes to finding materials on set. When Geyra was working as camera scenic artist on a Woody Allen movie, he needed to make pure white sheer curtains look older. He searched the studio and found a large container of hot water and tea on hand for the crew. He made a gallon of tea, put it in his sprayer and dyed 20 feet of curtains in minutes. "Woody Allen comes in and goes, 'It smells wonderful in here. Chamomile right?' That was a real tea bath," Geyra says. Sometimes these materials can be created simply by carving something new out of foam found dumpster diving, or adding shoe polish to furniture to reduce glare. The alterations don't have to last long, especially when on a television or movie set. Their creations are equally temporary when it comes to the giant backdrops on Broadway. "Some of it is donated, some of it is destroyed," Geyra says. "You do your work, you do it the best, it's accepted, your reputation is in tact, and you move on." Geyra has become used to the realities of impermanence, understanding that what really matters is getting the job done. But if there's anything Geyra learned from the industry, it's that you never stop learning from those you work with. The life of a scenic artist is a very social one, with hours of work on scaffolding alongside a variety of people. He worked in some of the most prominent New York scenic art studios of the industry: Hudson Scenic Studios and Scenic Art Studios. Those studios dominate the market and have a reputation for attracting the finest scene painters in the region. The artists are constantly bouncing ideas off each other about artistic approaches and methods. "It's so important to keep an open mind with things," Geyra says. "That's what I learned from being a scenic artist more than anything else. If you or anyone around you gets an idea, never dump on it. Always be open to other people's opinions and be able to defend your own opinions." Geyra's good friends still in the industry miss his presence in New York. Ian Zdatny recalls his absurdist sense of humor and impressive talent. "Don was the kind of guy that would break out into a skip in the middle of the street," Zdatny says. "But I would say Don is one of the finest living artists, scenic or otherwise, that I know. Don has Old World skills. He can really bring imagination in his art that allows people to see it in a way that they couldn't before." Whether this talent is natural or learned is unknown, but Geyra credits much of his skill to great artists and mentors. He first began his scenic art career in a New York apprenticeship with artist John Koch. Koch was one of the best in the industry and would take jobs outside the Scenic Artists Union in order to give beginner designers the opportunity to work by his side. Apprenticeships are the best way for an artist to get a feeling for the way things work and, most importantly, learn the techniques crucial to a scenic artist's life. However, in order to do big time scenic work, you must be a member of the union, and to be in the union you must have experience. This is why Geyra wishes to take his experiences in scenic painting and use them to help others launch their careers. "I feel that students really need the opportunity to earn a living when they leave school. I can prepare them for that," Geyra says. "No matter what your background is, when you go into the big time, the learning starts right from the beginning." He hopes to one day teach students at IU, but in the meantime he's using those Old World methods back at his home in Bloomington. His artwork covers the walls, and he cheerfully shares the stories behind each one. A mountain landscape holds the romance of how he met his wife, a small simple painting of a doorway represents happy college memories and a large green tinted stairwell leads down to the loft of the Ramones, packed full of youthful troublemaking. In Geyra's home studio, he works on a painting of a late-night motorcycle trip. Worked completely from memory, the piece brims with emotion. "This was so visceral," Geyra says. "This painting is all coming out of my head. It was like a dream. This trip was at four in the morning and, well, we had been drinking all night, but it's a lot of fun to be in a group like this -- to ride as a group." Geyra has had his motorcycle since the days of CBGB and the Ramones. It's one of the ways he relaxes and shows his carefree side. Not that he's so serious anyway. He smirks at his reflection as he tries on a hotdog hat in the mirror. Inside, Geyra is still a young rambunctious artist on the Bowery. Although he's retired from New York, he will never stop painting. He remembers his friends the Ramones, along with others who rose and fell, and paints in their memory. Dee Dee Ramone and the rest of the band were his good friends, but he recognizes they were tragically flawed with drug addictions and destructive lifestyles that eventually killed them. "I've known a lot of really, really great and important artists who are no longer alive," Geyra says. "And I'm still alive. And almost every day I think about somebody and think that I owe it to them to paint. Because I still can. And I know that they would still create too if they could." Did you know that the majority of your favorite movies and TV shows have artificial sets? It's the job of artists like Don Geyra to render these hyper-realistic scenes from scratch. Next time you watch these movies, see if you can spot some of the scenery created by Geyra himself. Julian and Sonnystop to pee on the side of a building in front of a large wooden door. That door is actually painted contact paper over an all glass building. The detail was so exact; the image was blown up for a billboard. A car crashes into a wall at the Port Authority Train Station, where they were prohibited from altering the building. The car actually runs into a fake wall that's a giant concrete extension painted to seamlessly match. The manager of the building saw the wall and was furious, thinking they'd damaged the real building, until they wheeled the fake away without leaving a mark. The show's office is set in an abandoned library, but none of the elaborate stone or woodwork is real. It's all built and painted for the show. Geyra says that typically, if there is a police station in a movie, it's staged on a set. Inside the army barracks looking out the window, you see rows and rows of other barracks. The views outside those windows are all huge printed backdrops, known as photo murals. To spot fake window scenes, look at the clouds -- are they moving?